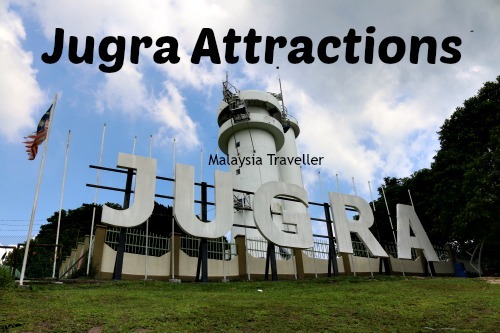 There are more Jugra attractions than just a lighthouse and paragliding. On the map at the bottom of this page I have plotted a list of 15 Jugra attractions, mostly historical. 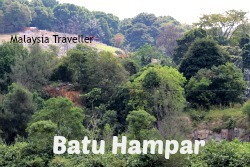 They are centred on Bukit Jugra and the former royal village of Bandar. It is easy to cover them all in one day but some are not so easy to find; in fact, I haven’t found all of them yet! 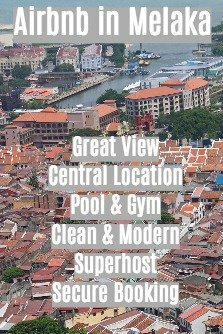 Here is some information on each of them. The best place to start your tour of the Jugra area is the Museum Insitu Jugra which is housed in a beautifully restored former police station dating from 1875. 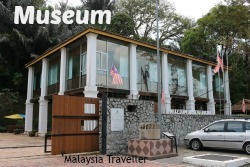 This great little museum, which opened in 2012, provides information on all the attractions in the area, together with historical details on the police station itself and the story of its restoration. 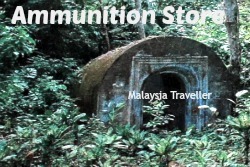 This bunker-like construction dates from the late 19th or early 20th century and was used to store ammunition for use by the police and military. It is made of brick walls a foot thick, it is eight feet high, six feet wide and ten feet long. It has a curved roof and an air vent. The information in the museum says that the ammunition dump is located 500 metres from the museum and 300 metres from the old District Office but so far I have been unable to locate it. It is a pity that clearer direction are not provided and, if the site is overgrown (highly likely), it should be tidied up. Eight wells have been identified in the Jugra Heritage Land Site and the museum describes the Old Well of Jugra as located at the foot of Jugra Hill about 200 metres from the museum. 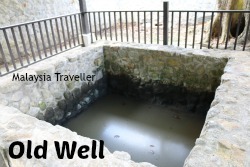 Again I did not find it due to lack of signage but there are two wells within the grounds of the museum of which this one (photo) is said to have existed before the police station was founded. This ruin still stands, just, next to the Chinese cemetery on the road leading up to the lighthouse. During the British colonial administration, there was a bank and court in this building to handle financial and legal matters for the Jugra District. The jungle is rapidly reclaiming what remains of this two story granite and brick building which was built in 1876. This palace was built in 1976 by Sultan Sir Abdul Samad (1857-1898). The ground floor was made of stone and the upper floor from wood. It fell into disuse after the Aladdin Palace was opened in 1905. The palace fell into ruins in the 1990s and is currently abandoned. Unfortunately due to lack of directions in the museum, I was unable to find the location of the ruin. This is the most exciting of the Jugra attractions. Jugra Hill rises 146 metres above the surrounding flat countryside and its proximity to the sea creates favourable wind conditions for paragliding and hang gliding enthusiasts to practice their sport. Paragliders jump off from the top of the hill next to the lighthouses and land on a field at the base where a container office holds the premises of the paragliding centre. A notice on the door gives the following phone numbers if you are interested: 019-3564061 and 017-3706817. I think they only operate at weekends. 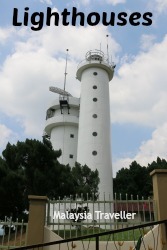 There are actually two lighthouses on the summit of Bukit Jugra: a colonial era tower and a shorter 25 metre concrete tower built in 1976 with lighting systems to facilitate navigation in the Straits of Melaka. Next door, the Mufti Department of Negeri Sembilan conducts monthly moon sightings and acts as a training centre for ilmu falak, the study of the astrology in Islam. There is a seating area in front of the lighthouses from where visitors can enjoy a wonderful view of the Langat River as it enters the sea. Close to the Museum is a small Chinese temple next to the river bank. Just above the temple is a rock with an indentation which, according to legend, is the footprint of Malaysian folk hero Hang Tuah. He appears to have left his heavy footed marks all over the country as other footprints are said to exist at the peak of Gunung Datum and at Cape Rachado (Tanjung Tuan). I did not take a photo of this rock at Jugra because there was a pack of territorial dogs who were not keen on my presence. Next time maybe! This shot was taken nearby. A short distance away is a small concrete landing on the river bank from where you can watch the dark brown waters of the Langat River drifting by. It is the sort of place where you could imagine to encounter crocodiles lurking (a nearby village is called Kg. Sungai Buaya - crocodile river). The Langat River would have been an important waterway for transporting people and goods to and from the interior. It passes through modern day Putrajaya, Bangi, Kajang, Cheras and all the way to Hulu Langat near Gunung Nuang. 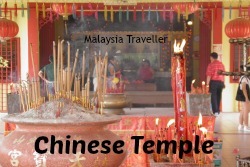 There are two larger Chinese temples on Jalan Bukit Jugra. Opposite one of them is a small restaurant famous for its Beggar’s chicken although it has not been open on my visits to Jugra. 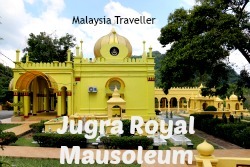 Bukit Jugra has been the site of the Selangor royal family mausoleum since the 1880s. The mausoleum complex contains the resting place of Sultan Sir Abdul Samad in Raja Abdullah who died in 1898 and the graves of other family members including Raja Muda Musa (died 1884), Tengku Ampuan Maharum and Raja Kahar. 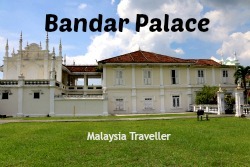 Bandar Palace, also known as Istana Alaeddin, was built in 1905 for the fifth Sultan of Selangor, Sultan Aladdin Suleiman Syah Ibni Almarhum Raja Muda Musa. This fine building has Malay, Chinese and colonial influences in its design. Sultan Alaeddin lived here for 33 years until his death in 1938. The palace fell into disuse after Independence. It was used for a while as a craft centre and an Islamic school. It became vacant again in 2006 and underwent some renovation. It is now open to the public. It is empty inside but the building itself is well worth a visit. This is the best of the Jugra attractions in my view. 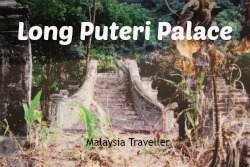 Long Puteri was the official residence of Raja Long Puteri, the granddaughter of Sultan Abdul Samad. It stood very close to Jugra Palace. Raja Sakiah Raja Mustar resided in this palace in the 1930s. It was left vacant in the 1960s. Being a building with wooden walls it has now disappeared from view and only the staircase of 14 steps is said to remain although again I was unable to find it. This heritage mosque, located beside the Bandar Palace, was built in 1905, the same year as the palace. Its design believed to be influenced by the Deli Sultanate in Medan, Indonesia. Sultan Aladdin used to deliver sermons from the pulpit here. 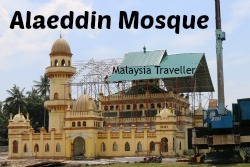 The mosque is currently undergoing major refurbishment. 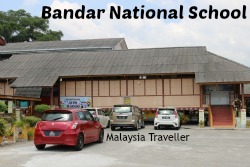 The original version of this school was built in 1898 and was named the Bandar Dandan Bakly Raja Malay School. 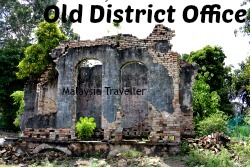 It was the first school in Kuala Langat district and one of the oldest in Selangor. It had 53 pupils, all boys. This building dates from 1952 and is located almost opposite the Alaeddin Mosque. It shares a compound with more modern school buildings. This completes my list of Jugra attractions but if you feel there any that I have overlooked please let me know. And, if you know the exact locations of any of the places which I was unable to find, I would be most happy to hear from you. 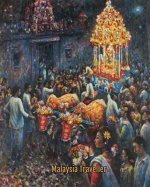 You can read something about the legends associated with Jugra on my blog. The location of the 15 Jugra attractions are marked on this map (some are approximate locations only). Click on the View Larger Map symbol in the top right corner to expand the map. Getting to Jugra attractions is easy enough. Take the E26 Lebuhraya Lembah Klang Selatan (SKVE expressway) and exit at Telok Panglima Garang (Exit 2609). After the toll booth, turn right on Highway 5. Then you reach a roundabout where you turn left on Jalan Bandar Lama. Follow signs to Jugra.